Bernie Sanders has a lot to cheer about, despite the New York primary polls. First, he has pulled to within two percent of Hillary in national polls. 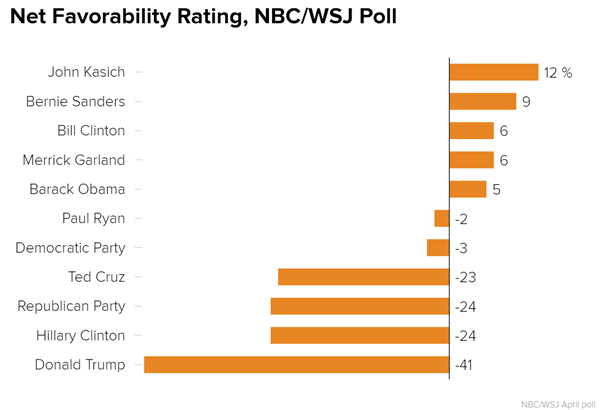 Second, he and John Kasich are viewed as most favorable of all candidates. And TIME magazine has named him one of the world’s 100 most influential people. On the eve of the important New York primary, a new poll shows Bernie and Hillary neck-and-neck, nationally. Hillary Clinton leads Bernie Sanders nationally by just two points in the Democratic presidential race, according to results from a brand-new NBC News/Wall Street Journal poll. 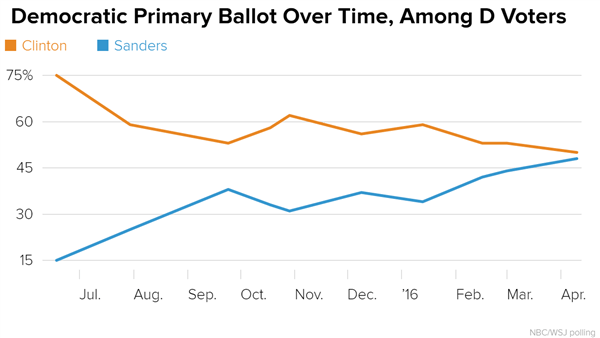 Clinton gets support from 50 percent of Democratic primary voters, while Sanders gets support from 48 percent. That’s down from Clinton’s nine-point advantage a month ago, 53 percent to 44 percent. . .
Sanders leads among men by 17 points (58 percent to 41 percent), whites (53 percent to 44 percent) and those ages 18 to 49 (66 percent to 34 percent). Frankly, people “like” Bernie and Kasich. Here’s a chart that shows why. 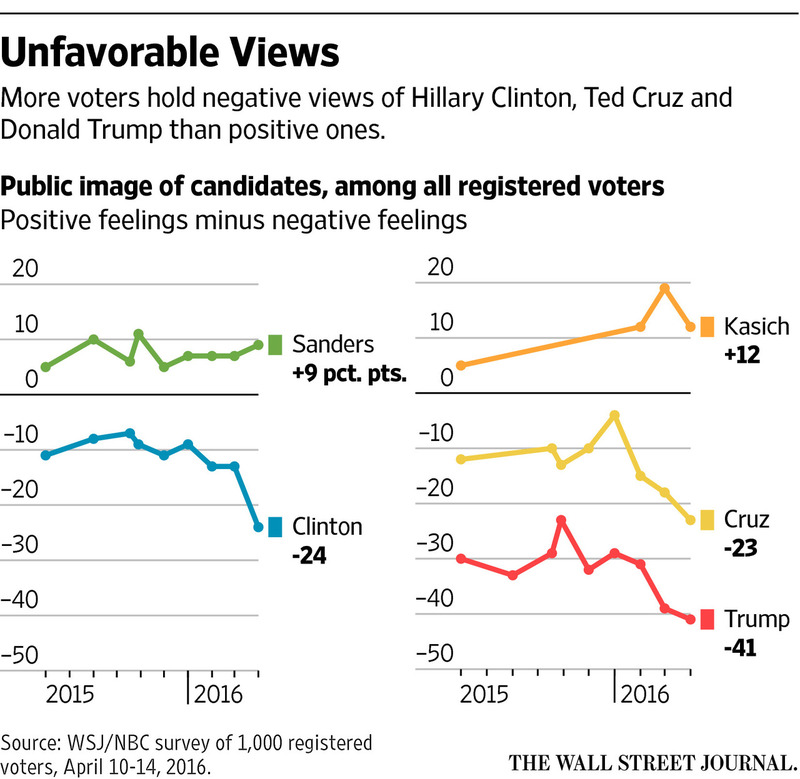 While Bernie and Kasich have retained their favorability rating, their opponents have been dropping, precipitously. Bernie also bested the rest in another poll. He walked away with Time Magazine’s poll of 100 Most Influential People in the World. It was a reader poll just released by the magazine. He beat all the other candidates. It should be noted that the poll was of readers, not experts, according to Wikipedia. First published in 1999 as the result of a debate among American academics, politicians, and journalists, the list is now an annual event. Although appearing on the list is often seen as an honor, Time makes it clear that entrants are recognized for changing the world, regardless of the consequences of their actions. The final list of influential individuals is exclusively chosen by Time editors with nominations coming from the TIME 100 alumni and the magazine’s international writing staff. Only the winner of the Reader’s Poll, conducted days before the official list is revealed, is chosen by the general public. . . The list was first published in 1999, when Time magazine named the 100 most influential people of the 20th century. Based on the popularity of the installment, in 2004, Time magazine decided to make it an annual issue, listing the 100 people most influencing the world. Those recognized fall in one of five categories. . .Titans, Pioneers, Artists, Leaders, and Icons. Follow the New York Primary results as they come in tonight. Such authenticity is much appreciated and inspiring to stick to one’s principles that the world can be a better place for many. Gratitude! Sen Sanders should be ashamed for where his campaign has chosen to go the past two weeks… Lies, false accusations, misleading “trips to Rome”, spending $445,500 of his donators hard earned $27 donations to go there, complaining that Independents can’t vote in a Democratic Primary? (Seriously?!) and a tone and rhetoric that only benefits the GOP in Novemeber, Bernie what happened to “I will not run that kind of campaign?” So disappointing! What’s truly disappointing is that crooked Hillary hasn’t been indicted yet. This Clinton Criminal will only see the White House from the barred windows of a van if it drives down Pennsylvania Ave on her way to the Big House…. Oh the Democrat party will probably make the prison add on a special wing for her complete with maids & butlers. She won’t suffer for want of anything unless it’s Bill. He will be partying all the time! Heck, they may even let her out to give speeches to the mega corporations & banks for $250,000 a speech! One thing is for certain: She won’t be going to the same kind of prison you & I would go to! Not smiling now is he! Who laughs last laughs best… once crooked Hillary is indicted! It is all but over so I have nothing negative to say about Bernie as for me he was the second best candidate. As a general rule those not in the race and the losing candidates always poll higher than the leader before the national election starts. Nothing new under the sun. I think the fact that Hillary is over 2.5 million votes ahead of every other candidate and Bernie is third behind Trump may be a bigger point to consider.